Ken Henson on Bulli Railway Station in 2004, with a couple of old sanitary pans that were disguised as pot plants during the Queens visit 50 years prior. WORD the recently crowned Queen Elizabeth II was visiting Bulli quickly spread around the coalmining communities of northern Illawarra in 1954. The coronation of a young and beautiful queen just the year before captured the imagination of the Australian public and thousands would gather for a glimpse of the new reigning monarch during her visit. 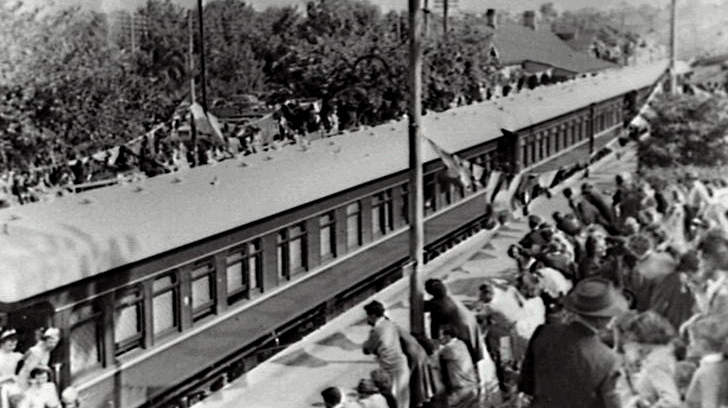 A surprise decision was made for the Queen to make the return journey to Sydney by Royal Train, causing a flurry of activity and panic from Bulli Railway Station staff. Eighty four-year-old Ken Henson had clear memories of when the Queen unexpectedly dropped into Bulli on February 12 1954 when interviewed for this story in 2004. 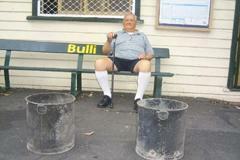 He was working as relief station master at Bulli, filling in for his station master dad, Jack. 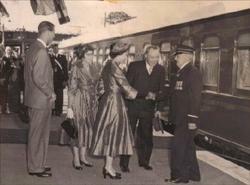 “On the Monday we got word from the district superintendent of railways at Thirroul to say the Queen and the Duke of Edinburgh were going to join the train at Bulli the following day,” Ken said. Ken was to be relieving station master on the day as it was his father’s rostered day off. “They cancelled dad’s day off and told him he would be required to work, which suited me right down to the ground because the honour belonged to dad and I don’t go in much for all that protocol stuff,” Ken said. The Queen travelled to Bulli by royal motorcade, after official duties in Wollongong, where she did a lap around the Bulli Showground in an open top Landrover to greet the people of the north Illawarra. They came in their thousands, children, mums and dads, dignitaries; even the swaggies camped in tin shack humpies behind the showgrounds clambered to get a glimpse of the young Queen. 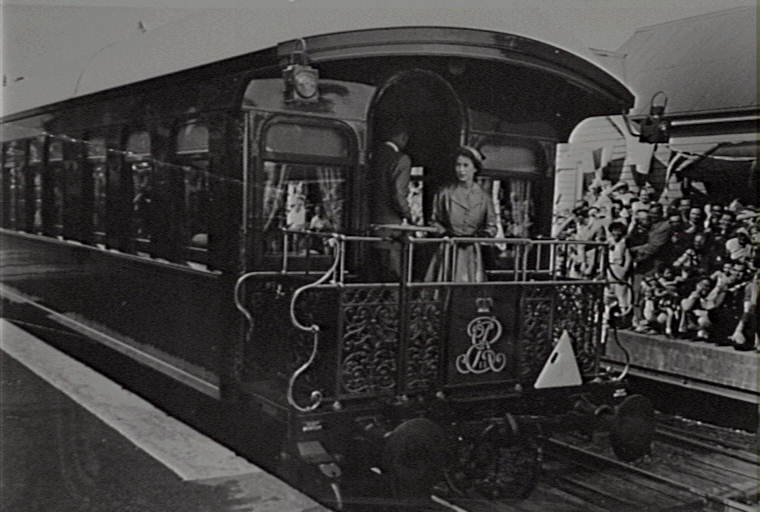 The story has it the Royal Motorcade was supposed to continue up Bulli Pass and onto to Sydney, but last minute concerns the Queen’s vehicle may overheat on the steep mountain pass caused a rethink and a decision was made to bring the Royal Train from Sydney to Bulli. The decision was the right one. When the Queen’s car – without her Majesty – continued onto Sydney it indeed overheated on Bulli Pass and the driver was forced to walk to Bulli Lookout Kiosk to fetch some water for the radiator. The story has it that the driver walked to the Bulli Lookout Kiosk where he sought a container to carry water back to his stranded steaming royal vehicle left on the pass. As overheated vehicles were a common occurrence on Bulli Pass, it was a required policy that a monetary deposit was left at the kiosk in exchange for a water container – and the Queen’s driver was not given any concessions. The kiosk operators at the time asked for, and got, a small deposit from the Queen’s driver for a water container to fill the radiator of the royal vehicle on the pass. Bronwen Chamberlain, who was operating the kiosk at the time, tells me that when the Queen’s driver came for water, her father, who was Welsh, asked for the deposit. “When I asked him why, he replied; ‘I don’t trust the Irish’. I was not happy,” Bronwen said. The late Jack Henson was said to be chuffed by all the excitement and was quietly honoured by the prospect of meeting the Queen. Jack, who was station master at Bulli for 25 years between 1935 and 1960, lived in the cottage beside the station and on news of the visit went to work making sure his station looked its best. Bulli was one of the busiest railway stations on the South Coast during the 1950s and employed about a dozen men including porters to bookings clerks. Ken remembers assistant station masters Frank Crowe, Hilton Rumble and Aleck Bowerman, as well as porters Lachlan Buggy, Charles Smith and John Crowe. “Most of them, including me, were there, dressed to the nines, on the day,” he said. The first sign something out of the ordinary was about to happen at Bulli Railway Station came when staff noticed a sanitary truck pulling-up on the western platform. “The sanitary men starting unloading 50 or so freshly blackened dunny-cans onto the platform,” Ken said. The idea of decorating the platform with plants posed the problem of finding enough large pots and some ingenious council employee suggested the tar blackened sanitary cans from the Bulli Sanitary Depot as ideal plant holders. They were disguised with bunting and paper in the royal colours of red, white and blue. Leading Porter Lachlan Buggy was in the signal box at the time and looked out after hearing all the racket of the dunny-cans being unloaded. “Gazing across and seeing all these sanitary cans being dumped onto the western platform, he looked at them, and said ‘what are they for? '” Ken recalled. Ken said after the cans arrived flags and bunting followed and the platforms were transformed into a sea of red, white and blue. “The place had to be spotless and everyone had to hop to it and clean the place up ready for the Queen,” Ken said. “A couple of fellows from the Government arrived to make sure everything was in order, including the way dad wore his war medals. Apparently the Duke is a bit of a stickler for protocol and the powers that be made sure dad’s medals were in the right order,” he said. Thousands gathered to see the Queen off from Bulli that summer’s day, taking in every vantage point imaginable. “It all ran smoothly because everybody did the job they were supposed to do – right down to the sanitary carters,” Ken said.